It was a grey and rainy day in North Hawaii today, this horse didn’t seem to mind much as it roamed around in a Parker Ranch pasture late in the afternoon. The pretty little yellow flowers in the pastures are known as ‘fire weed’ and has a somewhat toxic effect on cattle and probably horses too. It’s one of those invasive species that has really taken-off on the island throwing the eco-system off balance. I felt somewhat off-balance, or out-of-sorts myself today, maybe it’s just the grey skies, or running around in the cold, windy rain taking photos, or the headache I’ve had this afternoon. If you haven’t already figured it out, you can click on the title of this post to listen to an Edie Brickell & the New Bohemian’s song, a cover of a Bob Dylan tune. 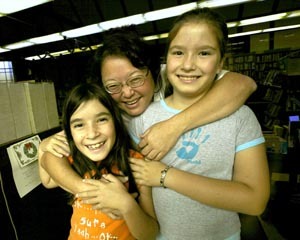 Got a phone call today from Dawn, the gal in the middle of this happy group, who is the librarian at Bond Library in Kapa‘au, Kohala. Dawn clued me into the collapse of a roadway near the library. The hard rains plugged a culvert with debris, then ran over the highway, then tore the whole thing away leaving a 20 foot deep by 20 foot gap in the highway. Photo by Dawn Shibano of Patsy, the heroine of the day! Lucky for drivers a gal at the library, Patsy I’m told, ran out into the rain to put out stuff to block the road and divert drivers before they drove into the asphalt abyss. She’s the heroine of the day as someone would have likely been killed had they driven in there. 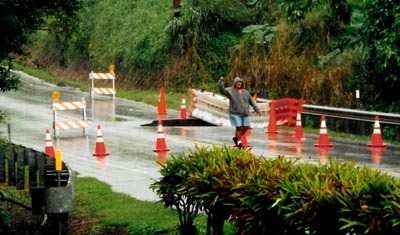 Dawn said they saw the water going over, then saw the highway sag, then finally watched the section tumble away. She shot some photos of her own with a film camera so if you want to see her photos you’ll have to drop by the library. My photo will appear in tomorrow’s West Hawaii Today. I couldn’t get too close to the gap as the highway was probably undercut by about five feet or so and could break free. Dawn is a very cool librarian and a fun person in general. She was named Librarian of the Year a few years ago by a state panel, quite an honor and well deserved. She’s rather camera shy so she tried to hide behind these two sisters who sometimes volunteer to help keep things both organized and not too serious. If you have the chance drop by this library, it’s very user friendly.